Application form will be invited online only. Candidates can deposit application form fee online or HDFC E Challan. Selection for the leading B.ed government, private b.ed colleges will be done only on the merit list of b.ed . Counselling will be conducted online mode. B.ed is two year Teacher Training program. now it sure that government has changed the pattern of B.ed program and course time Duration to Two years. this news is confirmed after publishing the b.ed jee 2019 official news regarding the B.ed admission 2019 is now updated . 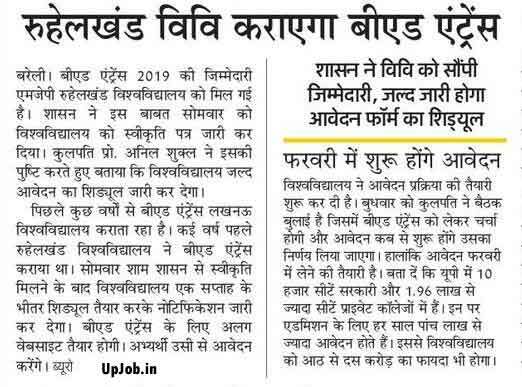 Important details of Up B.ed entrance examination 2019 as are follows . Admission process: admission for B.ed program will be done only on the state level merit. all government, private college and university will use b.ed score for taking admission in B.ed program . Education qualification: graduation Degree with at least 50% marks. First of all candidates required to do a registration online at the official website which is www.upbed.nic.in. After completing the registration process, just pay your application form fee via online payment or offline HDFC E Challan. After depositing your application form fee , revisit at the official website of Up Bed and enter your Journal No and complete the application form . Don’t forget to take a print out of application form. Dully filled application form printout will be also dispatched to concerned university via speed posts till the last date. 5th step – dispatch the printout to the university . Enter a valid emailed and phone no in registration form because all information regarding the admission , counselling and other details will be delivered to your registered mobile no and email id. Questions paper 1 will contains question from English and Hindi languages but candidates are required to attempt any one language which they have selected during filling application form . Part A is compulsory for all candidates of paper 2 . And candidates are require to attempt any one subject from art , science , commerce or agriculture, which you have selected during application form submission. So be careful before attempting the questions part B , from paper 1 and paper 2 .
can apply on 49.33% marks ? I am Ma 50% marks are elagibile for up b.ed test? Sir I'm m.com post graduate with 55%.. M I eligible for up b.ed entrance test?? Sir I'M Btech(CS):M I eligible for up Bed entrance test 2016? i m bsc 6th sem student and my semester complete in may and result out till 10 june 2016 .can i opt for up b.ed entrance exam 2016? SIR I AM RAJESH KUMAR FROM BIHAR STATE AND B.A GEOGRAPHY (HONS) : M I ELIGIBLE FOR UP B.ED ENTRANCE TEST 2016? I am appearing b.sc.last year . Can I apply b.ed.entrance???? I'm sharlain ahmad khan my qualification M.A (Political science 53 % but graduation Art mark 48 % ) . Can I apply B.Ed entrance. What is the fee structure of B. Ed for pvt and govt colleges? Sir maine B.A. ( maths, statistics, economics) 2014 mein pass ki h..
Sir mein B.ed ka form bharna chata hu aur mera main subject "Maths"
Pls advise which books need to prepare for appearing UP B.ed JEE entrance exams. SIR,mera m.a previous m.a previous english lll ka pepper have 22April ko b.ed ka bhi exam have Sir please date postpone kr de Jesse mai papper details saku. I am a commerce Graduate having 59% of marks. so I want to study in bed course. Am I eligible for BED course. i am completed my graduction with 49% than can i apply for b.ed .